Ok Character - helping schools throughout Oklahoma. The Oklahoma legislature will present Citations to the 2019 State Schools of Character on March 25. Since 2011 the House and Senate have celebrated the State Schools of Character each year and since 2016 a day has be declared Character Day at the Capitol! Roosevelt Elementary in Pryor. The addition of Roosevelt means that Pryor Public Schools becomes the first district in Oklahoma to have all of its schools recognized as State Schools of Character – and in May Roosevelt will hopefully join the other schools in being named a National School Of Character. Sadler Arts Academy in Muskogee. This is another first! Sadler was named a State and National School of Character in 2014 and since the designations last for 5 calendar years Sadler reapplied for 2019. Having been named State SOC again, Sadler becomes the first Oklahoma school to be recertified as a School of Character. The schools will find out in May if they are named National Schools Of Character. Click HERE to see the full list of Oklahoma Schools of Character since 2011. The 2019 State Schools of Character have been announced. If you plan to apply for 2020 you only have about 4 months to wait!! The next opportunity to apply for State and National School of Character will in late July or early August 2019. Consider having an 11 Principles Professional Development. Conduct spring climate surveys for all stakeholders (contact us). ​High schools may want to start Ethics Bowl teams to compete statewide and nationally. Remember that applications and awards come and go, but character endures. Three more Oklahoma schools join the ranks of National Schools of Character for 2018! Schools Develop Cultures of Character?
" I have not been part of a more meaningful experience." "As a professional educator of almost 40 years, I have not been part of a more meaningful experience than the Schools of Character process. The 11 Principles​ has helped us to evaluate ourselves in such a way that it elevated us to the next level in developing a true culture of good character. And the most amazing and beneficial aspect is that it is on-going. More than being certified as a School of Character, the 11 Principles is a tool for continued improvement at Eisenhower." Developing a Culture of Character Can Begin Today. Why Start the Character Journey? The 11 Principles of Effective Character Education provides the means for evaluating current status and mapping a future course. OKcharacter.org helps schools and districts foster and cultivate climates in which students and adults flourish and succeed. We are not in this alone! Schools that develop cultures of character not only benefit with higher academics, attendance, and improved behavior – they become beacons for other schools to begin the journey. OKCharacter.org is a 501c3 Oklahoma non-profit organization that helps public, charter, and private schools throughout Oklahoma implement best practices for character development through evaluation and improvement of the culture and climate of the schools. Although many states have Schools of Character State Coordinators, we are the first organization to be an official affiliate of the Washington D.C. based ﻿Character.org. 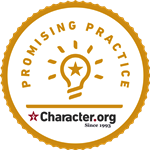 Provides training in the 11 Principles of Effective Character Education developed by Character.org which has aided and recognized exemplary schools since the mid-1990s. Assists schools in evaluating their culture and climate as they take steps toward becoming State and National Schools of Character. The emphasis in character development is not relegated to students but also has an emphasis on staff, both certified and support. Acts as a resource for understanding and navigating the School of Character and Promising Practice applications. In 2016 Oklahoma became the first state to have an organization that is an authorized affiliate of Character.org. OKcharacter.org offers local help to schools and districts throughout the state. "The Schools of Character programs sponsored by Character.org in Washington, D.C. have the potential to revolutionize school culture across our great state of Oklahoma. As former Governor of Oklahoma and past Vice Chairman of the Board of Directors of Character.org, I heartily recommend that schools across the state look seriously into implementing the 11 Principles of Effective Character Education, apply for Promising Practices recognition, and begin the process of becoming National Schools of Character."